Everyone needs a Valentine's day pop-up in their lives and we have one coming for you! 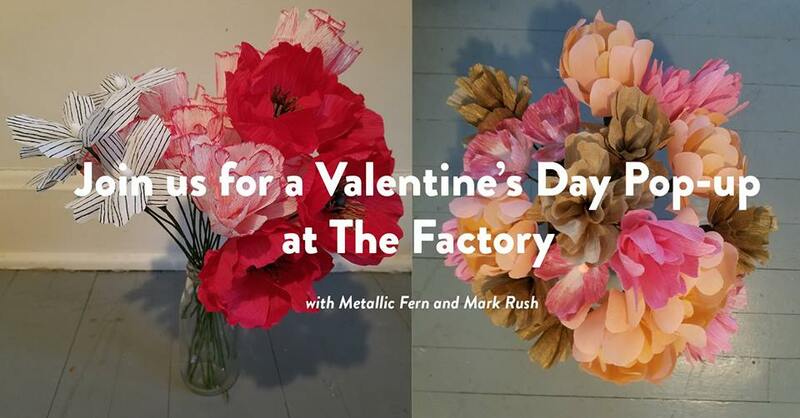 Metallic Fern will be at our Factory on February 9th from 10am-1pm selling her handmade, paper flowers. You'll even have the chance to DIY your own Valentine's card for that special someone in your life for $5. But wait there's more-- Mark Rush will also be popping up for a mouthwatering cheesecake truffle + coffee pairing. For another $5, you'll be able to taste THREE valentine's themed chocolate and cheesecake truffles + Roasterie coffees that you'll want to indulge in this Valentine's season. You wont want to miss this extra special Valentine's Pop-up at the Factory on February 9th from 10am-1pm so MARK YOUR CALENDARS NOW!